Do you fantasize about an I.P.O. – Initial Public Offering – as the end game for the early years of constant work and sacrifice that came with starting your own Company? Going public, selling out to the equivalent of IBM, Hewlett Packard or Google, represents the big payoff. The more likely version of a business owner’s “Success Story” is the creation of a sustainable business that allows you to make a good income for a number of years in exchange for hard work and dedication. 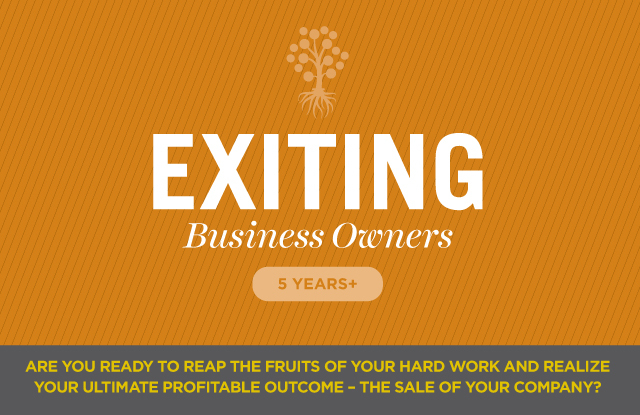 In truth, for most successful business owners, the end game is the sale of their company. I call this the U.P.O.  Ultimate Profitable Outcome. Selling your business can translate to a more comfortable retirement, higher education for your children, or perhaps that vacation home you’ve always wanted. Many business founders cling to their companies because they believe that they and the company are inseparable; that without them the company has no value. In most situations, especially if you have employees, a respectable customer list and solid processes for delivering value to those customers, you can sell your Company and move on to a new chapter of your life. And take a substantial cash payout with you as you begin anew. 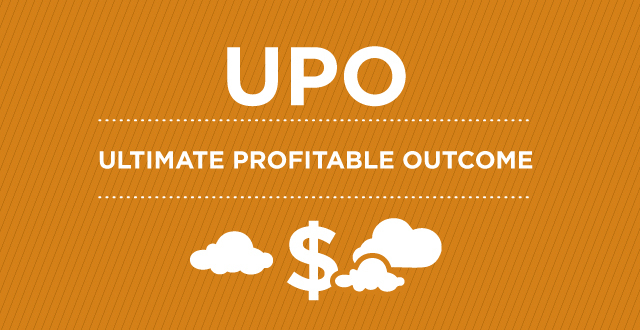 I help business owners understand the U.P.O. of their companies and position themselves for the best possible result. I share my own experience from selling my own business for top dollar, as well as dozens of other transactions I supported for clients in my 30+ year career. Based on my Financial Visibility Philosophy (see About Me for more on this), I have created a 3-step program that gives you insights to the real value of your business and prepares your to demonstrate that value to potential buyers. Step 1: Financial Position Analyses – using reports from your existing accounting system, we review where your business is today. I prepare several key analyses that allow us to identify exactly what factors are driving the current successes of your business and represent the most value to a potential buyer. Step 2: Discretionary Cash Flow – a report that I use to estimate the dollar value of your Company. We work together to research the standard valuation practices for your industry. We review any changes in strategies that might benefit your goal of selling your Company. 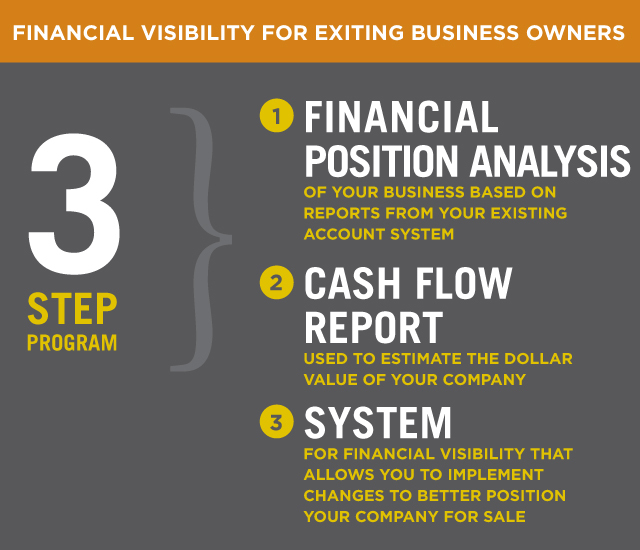 Step 3: Financial Visibility System – procedures that allow you to implement any changes required to better position your Company for sale. Together we outline revenue and costs that are then compiled into an annual budget and cash flow projection. From there we devise a meaningful Visible Indicators of Performance (VIP ) Dashboard that allows you to manage for value retention. We outline a plan of action to attract the best possible buyers for your Company. Note: The companion Exiting Business Program Workbook becomes your permanent record that documents where you are when we start the Program and the development of your strategies to retain value in the marketplace. Your Financial Visibility System will add value and make it easier to sell your business faster, since you will be able to give a prospective buyer a complete understanding of your Company finances in a clear and concise format.